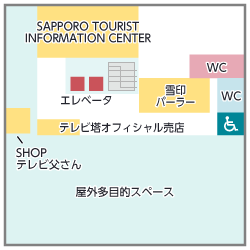 Sapporo TV Tower highlights check / Sapporo sightseeing information "EnjoyJapan! Hokkaido edition"
Check all the highlights of superb view spot "Sapporo TV Tower" in Sapporo city! Overall information of events, souvenirs and coupon info. Sapporo TV Tower, constructed in 1957 (Showa 32), has 147.2 meters high and the total construction cost was 170 million yen. The tower is designed by Mr. Tachu Naito, who is a famous designer and planed "Tokyo Tower" and "Tsutenkaku" in Osaka as well. In 1961 Mr. Matsushita Konosuke came up with the idea to build a giant electric clock at the bottom of TV tower's observatory floor, which was later donated by his company, Matsushita Electric Industrial co. ltd (currently Panasonic), hoping "If we put a clock, people would definitely look at it." As Mr. Matsushita expected Sapporo TV Tower became a symbol of Sapporo city and many people look at the clock even now. Furthemore, a lot of tourists visit the TV tower observatory floor for sightseeing and admire the superb view of Sapporo city. In this edition we would like to show the highlights of "Sapporo TV Tower", a symbol of Sapporo city. 5, Local specialty! Yuru chara (relaxing character) "TV-Tosan (Daddy)"
10, Comments from EnjoyJaoan! Editorial dept. A symbol of Sapporo - "Sapporo TV Tower", where a lot of tourists visit every year. In the tower there are "Observatory floor" from which you can see the entire Sapporo city, restaurants, "souvenir shops" where popular souvenirs are on sale and various events take place. First of all, let's see the facilities of each floor. B1F "Tele Basement Gourmet Court"
Now, I would like to introduce the highlights of Sapporo TV Tower. First of all, the best known highlight of Sapporo TV Tower is the superb entire view of Sapporo city from the observatory floor. You can see the city to any direction, North, South, East and West. Day time view is superb, night illumination is great, and scenery changes according to season. Every time you visit, you may enjoy different beautiful scenery. Now, here are photos of views from the observatory floor. When you arrive at the floor with elevator, you may see vast view of Sapporo city in front. First, please look at Odori park street which is the central area of Sapporo city. In Spring the view of Odori park street is full of greens. Night illumination of west side of the park is very beautiful. So please check it out, too. JR Sapporo station is seen on the left end, and next to it is JR Tower. You can walk from Sapporo TV Tower to JR Sapporo station in 10-15 minutes. On the right end, Tsudome, a venue of Sapporo Snow festival which looks like a small UFO disc, can be seen. Scenery of Sapporo city toward the East. View of Sapporo city from 90 meters high is very beautiful. Numerous skyscrapers and high apartment buildings are jostling. It's not obvious, but in this direction Hokkaido University can be seen in the front end and Sapporo Dome which is not in the photo. The direction which you see mountains - that's South-West. "Moiwa mountain" is seen on the right end. Actually, if you see Sapporo TV Tower illumination from Moiwa mountain observatory base, it's very beautiful. If you have a chance to visitMoiwa mountain Observatory baseplease check it out. From observatory floor at night, you can enjoy beautiful night view which is far different from daytime scenery. Night view of Western Odori park in Sapporo city. There are a lot of lights from office buildings along Odori park, and night view is colourfully shining. Night view of Sapporo city East direction. In the East there are residential areas and lights of buildings and houses are glittering. As we have seen, this observatory floor shows sceneries in day and night which are completely different. Please visit on your favorite time during your travel. One of entertainments to enjoy the floor, a little bit inclined window named "Kowaso (looks scary)". Written as "You can lean on the glass! Come closer and look down"
Other must-see spot 2! "Idogata (a well shape) monitor"
There was something which looked like a well, and I stepped on the base and look inside the well. I saw a monitor which shows a waving Sapporo TV Tower. Other must-see spot 3! "TV-Tosan (Daddy) shrine"
TV Daddy and Mommy are smiling. There is also fortune teller, so if you feel like, why don't you try it? Other must-see spot 4! "Limited TV Tower medals"
Limited medals of TV Tower were sold. One medal costs 200 yen. Besides limited medals, there is a vending machine of memorial medals which can be purchased only in TV Tower. Other must-see spot 5! Souvenir "Sky shop"
In observatory floor there is souvenir shop called Sky shop. Here you can buy famous souvenirs from Hokkaido or Sapporo and character goods of Sapporo TV Tower such as TV-Tosan. Buy ticket at the counter or in vending machine on the 3rd floor, and enter to the observation area. This is the reception. Please note that there is no restrooms in the floor. Only those who bought the tickets can take the elevator for observatory floor. The height of observatory floor is 90 meters and it takes only 60 seconds to arrive by elevator. Sapporo TV Tower is not only observatory tower. But it has restaurants of various gourmet genre. In Sapporo TV Tower there are many restaurants. 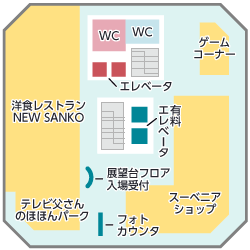 On the 3rd floor there is a Western style restaurant "New Sanko". 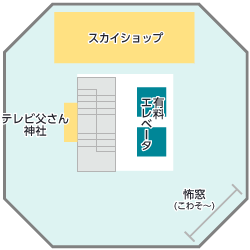 It is located outside of charged area, so you don't have to buy a ticket to go to the restaurant. There are many restaurants and bars on BF1. 5, Local specialty! Yuru-chara (relaxing character) "TV-Tosan (Daddy)"
Next, let's focus on Sapporo TV Tower's non-official character "TV-Tosan" who is loved by visitors. "TV-Tosan" made his debut in May, 2002. TV-Tosan has a "wife" and "children" and they are said to become citizens of Chuo-ku, Sapporo city recently. In observatory tower there was Purikura (photo taking booth) machine of TV-Tosan. And in "Nohohon park" on the 3rd floor, many figures of TV-Tosan. As there were many souvenir shops in Sapporo TV Tower, I would like to introduce some souvenirs which are popular. There were various shops selling TV-Tosan goods. This is must-see for Yuru-chara fans. Rich and varied popular souvenirs from Hokkaido! "Yukijirushi parlor"
On the 1st floor there is Yukijirushi parlor. Various souvenirs and "soft ice cream" are on sale. As the soft ice cream is delicious, we highly recommend! In Souvenir shop on the 3rd floor, many standard souvenirs such as Shiroi Koibito of Jaga Pokkuru are on sale. The highlights of Sapporo TV Tower is not only the view from observatory floor, but also its figure seen from outside as it varies depending on where you see from or which season it is. This is TV Tower seen from the fountain in Odori park. And this is a shot from closer place to TV Tower. For your information, this is the figure of Sapporo TV Tower seen from the right foot. 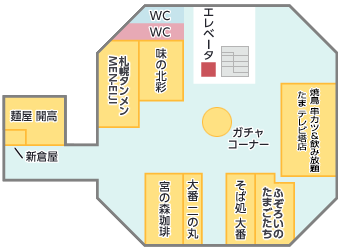 The 2nd floor's height is almost same as 5th floor of an ordinary building. This is Sapporo TV Tower from Winter Odori park. The contrast of white world covered with snow and red light of TV Tower is poetically beautiful. In Winter the beauty of the tower is doubled surrounded by illumination! Night illumination and ice statues are shining and very impressive. Sapporo TV Tower seen from JR Tower observatory in JR Sapporo station is also beautiful. In addition, if you see from "Moiwa mountain" which is Sapporo's famous night view spotSapporo TV Tower is remarkable. As we have seen, seeing Sapporo TV Tower is enjoyable depending on place and season. Please remember it. In Sapporo TV Tower regular events take place. We would like to introduce selected popular ones among them. In Summer "Sapporo Classic Beer Garden", which is a famous brand of Hokkaido beer. is carried out on 1st floor of Sapporo TV Tower. Hokkaido local specialty, Mongolian mutton barbecue! And nothing can be better than cold beer in a hot Summer day! In Winter Sapporo TV Tower Preparation for Christmas starts one month before and Christmas tree and illumination appear to boost the celebratory atmosphere together with illumination. As we have seen the illumination and lights of Sapporo TV Tower are really fantastic. If you want to enjoy sightseeing combined with Sapporo TV Tower, there is a good deal ticket. If you want to enjoy observatory in day and night, better to buy the following ticket which allows you to go up to the observatory twice. Usually single visit cost 750 yen, so it's quite good deal. With this plan you can chose 3 of many sightseeing places that are located within 30 minutes transportation from Sapporo city. If you want to enjoy both of Sapporo Clock Tower and TV Tower, combination ticket is recommended. It's 5 minutes walking distance between Sapporo TV Tower and Clock Tower. ※For high school student at 18 years or younger, Sapporo Clock Tower is free of charge. 10, Comments from EnjoyJaoan! Editorial ept. We went up to "Sapporo TV Tower", which stands as a symbol of Sapporo city for the first time, and the view from 90 meters high was marvelous. Around Sapporo station, many sightseeing spots are located such as Sapporo city Clock Tower, Odori park and Former Hokkaido Government main building, in addition to Sapporo TV Tower. It's enjoyable to walk and drop by the sightseeing spots, looking the scenery. Sapporo TV Tower is memorable also for various events such as beer garden in Summer and Snow Festival in Winter. You can see inside Sapporo TV Tower by Streetview. Please check the places you are interested in. "Otaru Canal" is a sightseeing spot in Otaru with buildings of nostalgic atomosphere. The place is not only of "nostalgic" and romantic" but there are more things to experience, such as their famous sushi and other Hkkaido gourmet, or canal cruises. Introducing here are the highlights of this popular sightseeing spot Otaru Canal! Popular by online reviews! Enjoy "Shiroi Koibito Cookie Production Line" and " Cookiecraft studio" of famous confection which Hokkaido is proud of in "Shiroi Koibito (White lovers) Park ", a sightseeing spot in Hokkaido! Soya Misaki cape, Japan's Northernmost land in Hokkaido! Let's go to see superb view of morning glow and sunset from a monument in Japan's Northernmost land! Popular awe-inspiring spiritual place! Information of mysterious "White Beared Waterfall" in Biei and Biei River which shines cobalt blue. Whole view of Sapporo! 「Mt.Moiwa」 the holly place for lovers and one of the three major night view spot in Japan. One of the best view spot in Sapporo! With the Statue of Dr. Clark and overlooking the Ishikari plain. Let's enjoy the Hitsujigaoka Observation Hill!